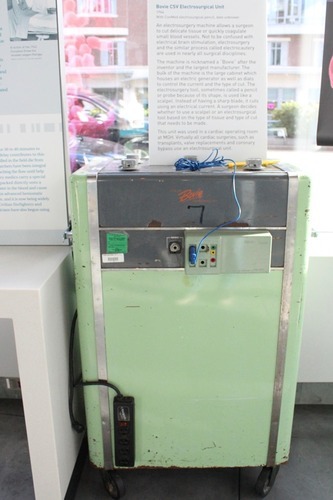 This medical device (c.1970) can be found in Paul S. Russell, MD Museum of Medical History and Innovation, Boston. The machine is nicknamed a "Bovie" after the inventor and the largest manufacturer. This unit was used in a cardiac operating room at MGH. Virtually all cardiac surgeries, such as transplants, valve replacements and coronary bypass use an electrosurgical unit. .